Outdoor air pollution kills more than 3 million people across the world every year, and causes health problems from asthma to heart disease for many more. This is costing societies very large amounts in terms of the value of lives lost and ill health. 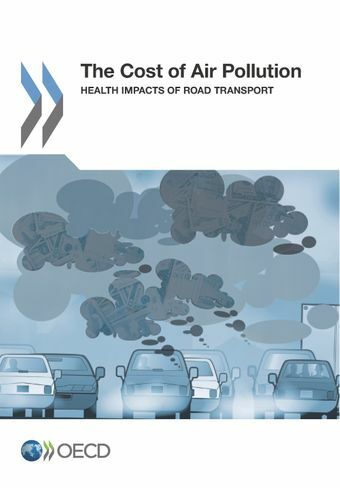 Based on extensive new epidemiological evidence since the 2010 Global Burden of Disease study, and OECD estimates of the Value of Statistical Life, this report provides evidence on the health impacts from air pollution and the related economic costs. Air pollution has now become the biggest environmental cause of premature death, overtaking poor sanitation and a lack of clean drinking water. In most OECD countries, the death toll from heart and lung diseases caused by air pollution is much higher than the one from traffic accidents. The OECD has estimated that people in its 34 Member countries would be willing to pay USD 1.7 trillion to avoid deaths caused by air pollution. Road transport is likely responsible for about half. Air pollution in OECD countries has fallen in recent years, helped by tighter emission controls on vehicles, but it has increased in China and India as rapid growth in traffic has outpaced the adoption of tighter emission limits. The switch to more polluting diesel vehicles in many countries threatens to arrest the downward trend in emissions from road transport in OECD countries. The number of deaths due to outdoor air pollution fell by about 4% in OECD countries between 2005 and 2010. But while 20 of the 34 OECD countries achieved progress, 14 did not. The number of deaths due to outdoor air pollution in China rose by about 5%, in India by about 12% over the same period. The cost of the health impact of air pollution in OECD countries (including deaths and illness) was about USD 1.7 trillion in 2010. Available evidence suggests that road transport accounts for about 50% of this cost in the OECD, or close to USD 1 trillion. In China, the cost of the health impact of air pollution was about USD 1.4 trillion in 2010, and about USD 0.5 trillion in India. There is insufficient evidence to estimate the share of road transport but it nonetheless represents a large burden. Remove any incentives for the purchase of diesel cars over gasoline cars. Maintain and tighten regulatory regimes, in particular, vehicle standards regimes such as those currently in place in the European Union. Make test-cycle emissions more similar to the emissions the vehicles cause under normal use. Invest in more ambitious mitigation programmes, including improved public transport. Continue the research on the economic value of morbidity impacts of air pollution and on the specific evidence linking it to road transport. Mitigate the impact of air pollution on vulnerable groups, such as the young and the old.